CIH Canada members gathered in Toronto on October 16, 2015 for their first annual member’s meeting. 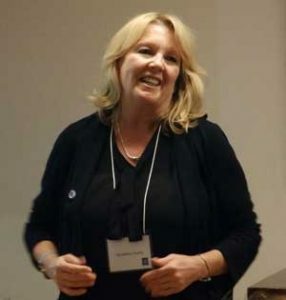 CIH President, Geraldine Howley, shared her vision of making housing a career of choice and CIH Canada Chair, Paul Tennant, led a lively discussion on our 2015-2017 strategic plan and future direction. Graduates of the Certified and Chartered online programs in attendance were also congratulated on achieving their designations. For those unable to attend our in-person meeting, we hosted a members’ meeting online and were able to connect with members in British Columbia, Alberta and Ontario. At both meetings, members contributed fantastic ideas and feedback that will help both the Advisory Committee and CIH Canada Board in planning for 2016. 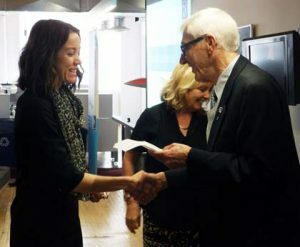 Receiving the CIH Canada recognition pin for Certified designation. CIH President, Geraldine Howley, shares her vision for making housing a career of choice. 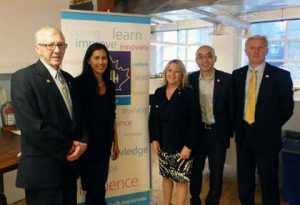 Colin Gage, former board member; Lisa Kotsopoulos, CIH Canada General Manager; Geraldine Howley, CIH President; Howie Wong, CEO, HSC; Paul Tenant, CIH Canada Chair.